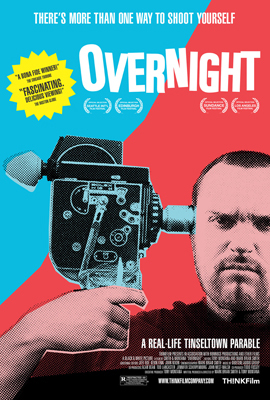 Thrillingly entertaining, bold, harsh, and a remarkable character study, Overnight is a documentary about ego and success in Hollywood. The film chronicles the overnight success of Troy Duffy, a young musician and screenwriter at the time, who destroyed a golden deal with Miramax resulting from his own arrogance, attitude, and self-destructive behaviour. As the tagline of the film reads 'there's more than one way to shoot yourself'. I've seen numerous documentaries about Hollywood and celebrities, but I've never seen one that captured the rise and fall of an individual so intimately. We're treated to home video after home video of Duffy celebrating with his friends, taking conference calls, having heated debates about his script, reacting to feedback, and so on. As an outsider your perspective shifts from viewing a talented guy who just happens to be cocky about his success, to viewing a talented guy who really has no clue about how out of touch he is with those around him. Duffy's persona is that of a spoiled film student who got an easy A, and that's because the deal he was offered was a dream come true. Miramax bought his script for The Boondock Saints for $300,000, gave him the opportunity to direct the picture with a $15 million dollar budget, allowed his band to release the soundtrack for the film, and Harvey Weinstein even said he'd buy the bar that Duffy worked at. Troy Duffy essentially won the filmmaker lottery. It's the classic tale of money changing the man (or at least revealling more of who he really is) but Duffy does start off with profound ambitions to simply make great movies. He's passionate, talented, driven, and he wants to take his friends along for the ride. He's entitled to some celebratory gloating, and really, who wouldn't be pumped? It's when the euphoria starts to fade that he doesn't seem to realize how alienating his arrogance becomes. Here's a guy who bought entirely into the hype of himself and figured it was enough to build a career on. He starts burning his bridges, but still talks as though he has everyone by the balls. If you watch his friends throughout the film you can just read the levels of disbelief on their faces. The politics and maze of Hollywood production is fascinating to me, and it's incredible to see such extreme sides of the spectrum. Duffy deserves what he has coming to him and there's an element of joy in seeing him get his comeuppance - although he has no shortage of people to blame when things start to go sour. Overnight combines the candid and blunt conversations that put you right at the source of the chaos, while also having broad enough coverage of the experience to contextualize the arch of the story. There's no doubt about Troy Duffy when the camera's pointed in his direction, and although the realities that come to light about his personality are unfortunate, they're also responsible for turning a deal gone wrong into a classic slice of documentary filmmaking.